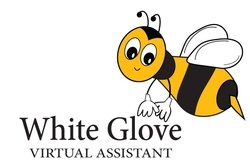 What is White Glove Virtual Assistant? White Glove Virtual Assistant offers customized and professional business services. We help companies focus on what is truly central to their business by taking over the tasks for which they don’t have time or expertise. We provide daily, weekly or monthly assistance. No task is too big or too small. Some of the work we are currently handling for customers include: HTML/Electronic Marketing development; CRM entry and updating; website updates, social media updates; sales support for sales/account managers; inside sales and follow-up on lead generation. In some cases, we work a couple hours a day. In others, we have set hours a week or month. Our customers decide how much time they need and what projects they need completed or handled on an ongoing basis. Our mission is to allow our clients better opportunity for growth by providing exceptional service, so our clients can focus on their core business objectives. We are passionate about what we do and are committed to providing excellent customer service. Our sales philosophy has always been customer driven and we are dedicated to helping our clients grow their business to be even more successful. - You feel overwhelmed with your workload. - You need help digging out from under the administrative pile. - You know you could really grow your business if you could focus more of your energies on revenue generating activities. - You want to be more productive and less stressed. - You know you need help but can't afford someone full-time. - You don't want the hassle of recruiting, hiring and training an employee. - You want (and need) more balance in your life. - You want flexibility , knowing that your time is your own and that administrative jobs are being looked after. According to the VAnetworking.com, a Virtual Assistant is defined as a highly-skilled independent professional who provides administrative, technical and/or creative business support services. They are your off-site administrative professional. 1. Physical Space – No need for clients to provide physical workspace. business with a VA handling all the administration tasks. 3. Payroll – Clients will never have to worry about payroll, taxes or benefits. 4. Partner – By hiring a Virtual Assistant, clients not only receive top-notch skills but a partner with whom to brainstorm ideas. Proud supporter of 100 Women Who Care Uxbridge. Proud supporter of the Duncan Scowcroft Golf Classic. Proud recipient of the "Outstanding Community Service" Award from the Uxbridge Chamber of Commerce.